(WKBN) - Over the past 20 years, many of the school systems around Youngstown have new buildings, thanks to money from the Ohio Facilities Construction Commission. The start of the statewide effort to build new schools in Ohio began in 1997 with what was then called the Ohio School Facilities Commission. Of the 48 school systems in Mahoning, Trumbull and Columbiana counties eligible for the money, 31 -- or 65 percent -- of the systems have used it. They range from a low of $12.3 million in the Springfield Local School District to a high of $190 million in the Youngstown City School District. The total amount invested in the 31 districts -- state and local money combined -- is $1.168 billion. On a Friday morning last month, Joe Traina, the Wellsville Schools buildings and grounds supervisor, led me into lunch at Wellsville High School. The building was the second in Ohio to open using state money dedicated for new schools. Twenty years ago, construction of the sand-colored brick building with a red metal roof, combined with renovations of the old high school, cost $13.5 million. The Ohio School Facilities Commission paid 87 percent of that. "I think it's in great shape. We have very, very few problems with this building," Traina said. "It enabled this district, which is a low-wealth district, to build a great facility...for ten percent of the actual cost," said Wellsville Superintendent Richard Bereschik. Wellsville High School has a traditional feel -- hallways with metal lockers that lead into classrooms. When it was built, whiteboards replacing chalkboards was considered high-tech. But Lakeview's new elementary and middle school, which just opened in August, is non-traditional. There are common areas, open lockers made of wood and the paint combination of white, green, purple, and gold. Each classroom has a garage door that can be lifted to give it a more open feel. "We did not want it to feel industrial or clinical. We wanted it to feel lived-in and homey," said Lakeview Middle School Principal Ashley Handrych. The cost of Lakeview's new school was $31.4 million -- almost two-and-a-half times that of Wellsville's. While the state paid 87 percent of Wellsville's, it only paid 30 percent of Lakeview's because Lakeview is a wealthier district. Still, it was a good deal. "We couldn't have done it, I don't think, without the state money," Handrych said. "I think for a project of this size, that would have been a struggle. Maybe a smaller building, it would have been something we could have locally funded but for this building, it was definitely critical that we get that piece of the puzzle." 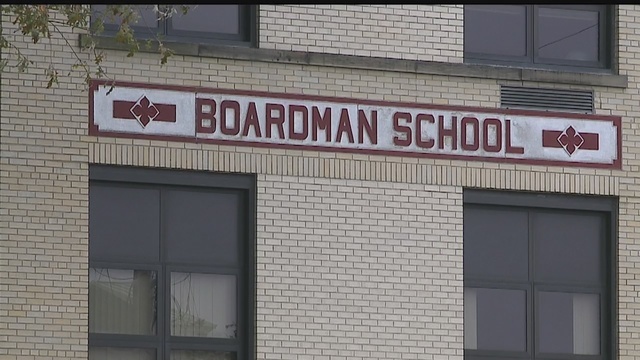 Boardman and Howland are among the districts being held back from receiving state money to build new schools. Ask Howland Superintendent Kevin Spicher and Boardman Superintendent Tim Saxton if they'd like new school buildings and you'll get the same answer. "Love new schools, absolutely," Saxton said. Saxton's office is in a building that dates back to 1916. There's computer wiring running along the ceilings. Money is available to replace this building through the Ohio Facilities Construction Commission but it would only cover 20 percent of what would be a $50 million project. "At an 80-20 split, I can't do that to our taxpayers," Saxton said. "What we would receive from the state right now would be somewhere around 18 percent," Spicher said. 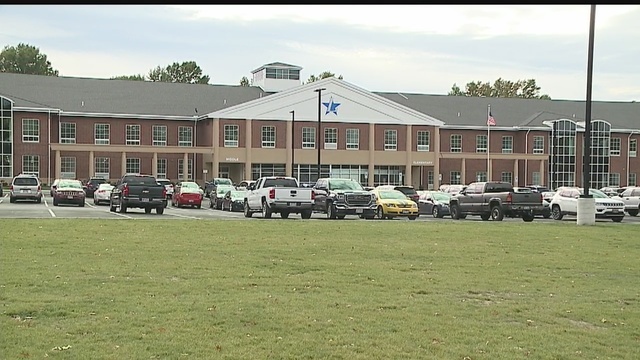 The Howland superintendent also wants more money from the state because the district's newest school was built in the early '70s -- the high school in 1949. But even if Howland was ready to build, the wait for the state money is six to eight years. "We feel very envious when we see other schools around us receiving new facilities," Spicher said. He said because Howland and Boardman are considered wealthy school districts, they receive less and must wait longer for state money to build new schools. "I do have a problem with the state system because I think it disadvantages schools that are out there that have aging facilities," Spicher said. "I believe the intent is good but it sounds like something Boardman always says -- 'the rules just don't work out for Boardman for some reason,'" Saxton said. Spicher said if the state gives Howland 30 percent, he'd like to consolidate to a two-building campus. Saxton said he wants 80 percent from the state, then he would consider asking Boardman taxpayers to help pay for new buildings. Wellsville and Lakeview are two districts that have benefited from state money that allowed them to build new schools. Lakeview's new elementary and middle school is brick -- with pillars and two sets of large windows. There's a robot mowing the grass and a garden on the roof. Inside -- there's a security monitor. The school has 133 cameras. "There's not much that goes on that we don't see happening," said middle school Principal Ashley Handrych. We took a tour, starting in the cafeteria and the learning stairs -- a place where students can congregate. "We thought it was a neat way, just kind of a showpiece in the building," she said. We took the steps to the second floor -- past the open wooden lockers and into one of the common areas. "So we have 10 classrooms that surround this space," Handrych said. Students use common areas to work in small groups. The school provides every student with a laptop. The most noticeable feature was the garage doors -- which can be raised and lowered. "We did not want it to feel industrial or clinical. We wanted it to feel lived in and homey," Handrych said. "I can actually use this as a whiteboard. It actually has five points of touch," said math teacher Mike Turco. Turco showed me his interactive flat screen that is in every room -- all which are tied to the internet. The school is one big computer lab. "There was a lot of skepticism at first but it works," Turco said. The school cost $31 million, 30 percent paid for by the Ohio Facilities Construction Commission -- the other 70 percent with a tax levy. "The process and the partnership that we had with the state was very positive," Handrych said. The state had requirements for example on square footage, given the projected population of the Lakeview Schools. The building says Ashley Handrych is as future proof as possible. "So a lot of our learning spaces have multiple purposes, everything is mobile in our building, so we tried to be as flexible and mobile as possible," Handrych said. No school system gets 100 percent state money. They all have to put something in but the amount varies widely.